Hooray for Vouvray: Why save French for Friday? I didn’t want to run, but I just did it knowing I’d feel better afterward. You know–sometimes we have that bottle of wine in the fridge or the shelf that’s the same: we are saving it, we just don’t know why. The Foreau Domaine du Glos Nadin Demi Sec Vouvray (translation: Chenin Blanc from France that borders Champagne) is that wine. Originally, I bought this for current roommate, Jill, to go with a cherry-apricot bread pudding with salted caramel sauce dessert. Upon first sip, I felt jubilant: I WAS RIGHT. This would have been GREAT with that wine. On the other hand, I felt sad that we didn’t get to the wine with the dessert. Small, first-world losses, I know. I also felt sad because it was slightly sweet upon first sip, too. I picked it to go with horseradish-beet crusted salmon. Tasting it with the sauce, however, I felt this was a great pairing to spicy sauces. The wine: at 13% alcohol content and with a demi-sec label, this wine has great acidity to be a dessert wine, aperitif, or ability to be paired with salty or spicy food. The viscosity is like velvet silk on the tongue. On the nose, it had a little apple and honey flavors. On the palette, it was rich with honey and honeysuckle, mineral, almond and a slight hint of lees (or yeasty) flavors. The length was long, the acidity medium-high, the pairings: amazing. This is a great, great, great example of a Vouvray. Um, hooray for a versatile wine that should appeal to most. 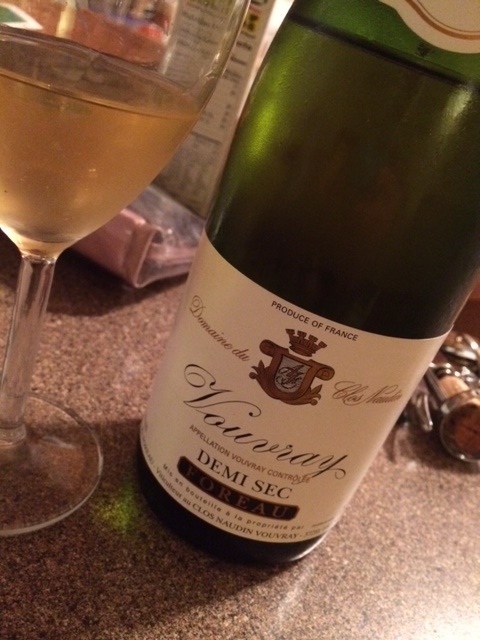 I would gladly drink the entire bottle–it is a great example of what a Vouvray should be. Just open it and enjoy–Nike would be proud of this wine slogan.